Analyst Maynard Um with UBS Investment Research does not believe it is a foregone conclusion that Apple will enter the television market by manufacturing its own HDTV. But he does believe the "logic is sound" for Apple to enter the market with a new product differentiated enough to stand out from the competition. 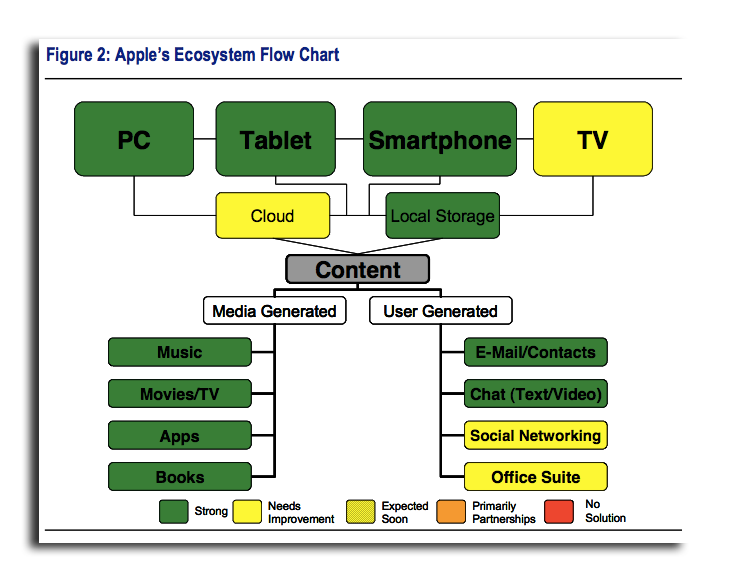 "We believe Apple is most likely to target the fusion of TV and (set-top box) market, the connected TV, as it enables Apple to add value through its innovative hardware/ease of use, iTunes ecosystem and provide a better overall consumer experience," Um wrote in a note to investors on Monday. Based on the market capitalizations for seven of the largest television set vendors, Um believes Apple could increase its own market cap by $100 billion if it could gain a similar share of the industry value as other major players like Sony, Samsung and Philips. 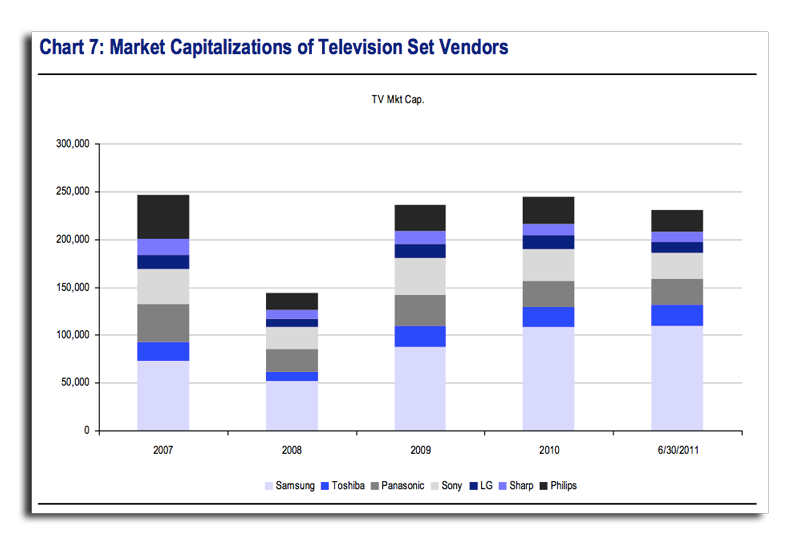 He admitted that tracking the market capitalization of HDTV makers i san "inexact science," because many of the companies in that market are major companies in which television sales are only a portion of their business. "If we assume that the market capitalizations are overstated because of the diversified business of each company, we still believe there is opportunity for Apple to gain an incremental $50 billion in market capitalization," he said. Rumors of an Apple-branded Internet-connected HDTV are nothing new, and one report from April even suggested that Apple could release its own television set this year. Despite that, Um does not believe that the prospect of an Apple HDTV is included in the company's current stock valuation, meaning investors could see huge gains if Apple does in fact begin selling an HDTV —something he sees as a long-term possibility. "We believe there is a likelihood that Apple will enter the television set market at some point in the future," Um said. "however, we do not expect this to happen in the next year." In looking for ways for Apple to grow its market cap, Um also suggested that Apple expand its retail "Genius Bar" concept to a pay model much like Best Buy's own "Geek Squad." This so-called "Genius Squad" could generate up to $2 billion in annual revenue for Apple, he said. Um doesn't see revenue being the primary driver for Apple to create a "Genius Squad." Instead, he believes the company could increase the value proposition of its products by installing a number of connected devices in a user's home. "For example, if a consumer came to Apple to purchase an Apple television set and have it installed by a Genius, the person may also choose to purchase an iPod Touch or iPad (to control the Apple television set) and an Airport wireless router or Time Capsule (to connect all the Apple products together) if ti will already be included in the price of the install," he said. "Hence, the service could be 'halo effect' driver for more Apple products."